This strikes me as odd, because I thought we were being careful back behind. But this is coming from Brad, the race director, who is parked in the middle of nowhere on a dirt road that intersects the single-track trail we’ve been noodling along for the last 7 miles or so. We’ve been running and shuffling for a couple of hours as part of a night race. Earlier, Mo spotted what was either a coyote or a fox next to the trail early on, and she has become enamored with the Fairy Dust that is everywhere. I can’t see the Fairy Dust, but fear making the Trail Fairies Mad. Could there be anything more dangerous than that ahead? Mo and I were both signed up for the 30k, but she had dropped to the 10k. But then she found out that the 30k was too loops of 15k so she decided to run with me instead. I was supposed to run the 30k but found out that it was too loops of 15k and only doing one of them seems a lot shorter. So we’re meeting in the middle, which seems odd since I vaguely recall meeting her several years ago. And here I am, 15 years later, still chasing after her. 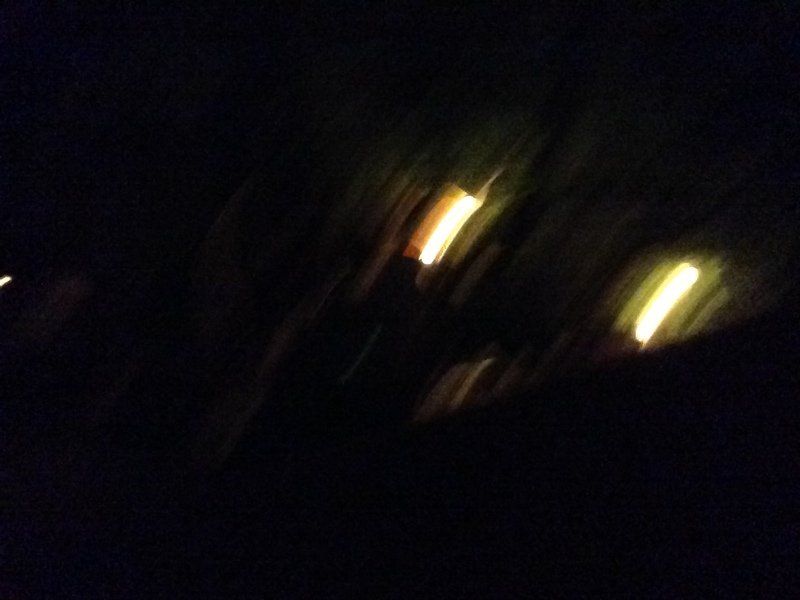 It’s odd running in a park at night. The world only exists as far as your lumens. Whatever a lumen is. But it’s fun, and the glow of Mo’s little red tail light assures me I’m not lost. I’ve always been a sucker for girls with little red tail lights. So what could be so bad that the race director feels the need to warn folks? A bunch of bees are up ahead and they appear to be anti-runner, he says. Several people have been stung already. He warns us that after we go down and turn and start up, there’s a log. Tip-toe around it and make no “man, I sure could use some Honey Stingers right about now” references and we should be OK. The trouble: This course is ALL down and up and logs everywhere. Mo, who says she’s allergic to bees, volunteers to go first. I am old and averse to pain, so I’m all for it. We run along, Mo a few feet in front of me, her little tail light reassuring. I don’t see anything unusual. Then sure enough, down, up and there’s the log. I don’t see any bees but decide not to look inside to find out. I glance up to ask Mo what she thinks. And then I notice. Her tail light, which a second ago was right in front of me, is now about a quarter-mile up the trail. She has performed her Usain Bolt impression and left me to die, knowing that the bees would attack the person in back. Mo is a Very Bad Person. But a Very Good Sprinter. Fortunately no bees attack, and I gradually shuffle along to the spot down the trail where she waits. “I did it for you. I was trying to draw them away from you.” And she gives me the little angelic smile. How can you be mad at someone after that? I spend the last 2 miles trying to get close enough to trip her. But she’s just too fast. Damn. 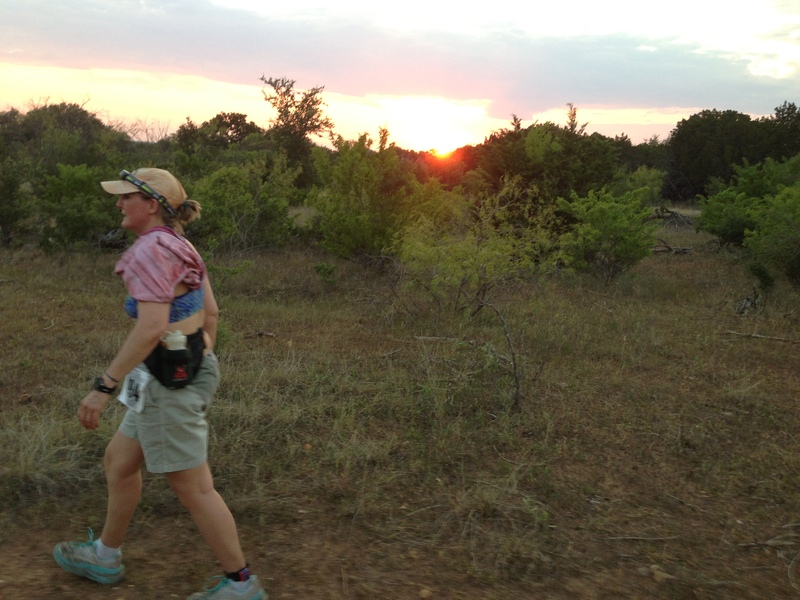 This entry was posted in running and tagged life, running, texas. Bookmark the permalink. “The world only exists as far as your lumens”. Perfectly said. Night races are sure a lot more common in Texas. I think Mo deserves an extra frosty for drawing the bees away from you. I’m glad you still blog! Ha! Too funny. Glad no one got hurt! Never too old to chase tail all night! ….it was a fox. lol.